The Sacramento Raider Rooters have buses from Sacramento to the Oakland-Alameda County Coliseum for ALL Raiders home games (pre-season, regular season and playoffs) - Raiders schedule 2017. 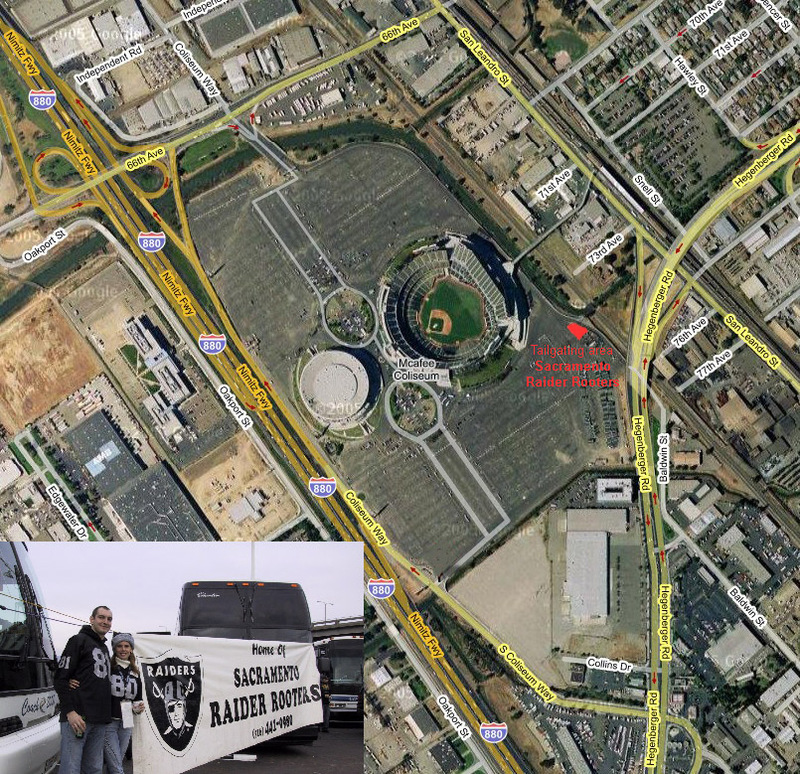 Our packages include a complimentary drink on the bus ride down and tailgate (ribs, chicken, tri-tip) at the Coliseum. We bring tents, tables, a generator and TV to watch the East Coast game prior to kickoff and do a large raffle with numerous Raider logo items, autographed player plaques, etc. You would need to bring a folding chair and cooler with personal beverages. To make sure you have a seat and don’t end up driving, reserve the season now! If you have special circumstance, i.e. you will only be attending a fixed number of games the season, please contact us to take advantage of advanced payment reduced price. Tailgate Only Guests: Friends & Guests in Bay Area are welcome to join us at the Coliseum and pay for tailgate only. We will need a head count in advance of the game (preferably 1 week). If you prepay the week in advance, member guests will be $25.00 each, non-members $30.00. On day of game, any guest will be $30.00 and subject to food availability. Ticket/Tailgate/Bus Packages: Starting 2nd level end zone Section 203: $200.00 members & $235.00 non-members. We also have a limited number of excellent field level seats with premium pricing in Sec 143 Row 44. We can also take payment by credit card, please add $15.60 per person if using credit card for full season payment, $12.30 for regular season only. For further information please feel free to contact us at Comfort.Master@juno.com or via phone/fax/mail. There is an annual Pig Roast & BBQ free to members and their families only and is scheduled a week or so before the first pre-season game. This is a family event with an Astro Jump, childrens games, egg toss and pinata. Last year we built a dance floor and were entertained by The Hucklebucks an award winning jazz, swing band from Sacramento and regular at the Sacramento Jazz Festival. We roast a whole pig. Last year's weighed over 289 lbs "dressed for the occasion", over 300 lbs on the hoof. A crew of 5 helped to get it into the BBQ. During the year we will have special events. Some of our past speakers/guests have been Jim Otto, Jack Tatum, Cliff Branch, Otis Sistrunk, Ben Davidson and Morris Bradshaw. The Sacramento Raider Rooters meets informally during away games and for dinner meetings at Crowne Plaza (formerly the Holiday Inn), 5321 Date Avenue (at Madison & 80). Join us for camaraderie, drink and food specials and wonderful RAIDER football games. Frequently there will be a raffle at half-time. All Raider fans are welcome. There is no cover charge during regular season. The Club organizes a Draft Day Party at a local location each year. A limited number of passes to summer training camp in Napa are usually available to the Club through the Steering Committee. Each year an away trip is selected following publication of the seasons schedule. The Steering Committee secures excellent pricing for a trip with two nights in a quality hotel, Saturday night dinner and gameday ticket. There has been an overwhelming response for traveling to an away game so we are getting the information out early this year to help you make your plans and not miss out.